When most engineers or contractors think of a “waterstop” what they’re generally referring to is a 50-foot long section of a flexible, water-proof material (usually plastic or rubber), six to nine inches wide, and installed along the concrete joint in between the formwork. This waterstop is more accurately defined as a hydrophobic waterstop: A waterstop designed to prevent the passage of fluids by repelling them along and away from the waterstop product, and creating an internal dam at and along the concrete joint. Hydrophobicity is the amount of water repulsion of the surface of the waterstop, and can actually be measured: Place a drop of water on the flat side of the waterstop to be tested and measure the relief angle of the water drop. The sharper the angle the more hydrophobic the waterstop material is. An angle 90 degrees or greater makes the waterstop truly hydrophobic and this product will actively move fluids along the joint and away from the source. Because hydrophobic waterstops act as dams at the concrete joint, a general rule of thumb is the greater the size of a waterstop (waterstop size is actually it’s width, e.g. 4”, 6”, 9”, etc. ), the greater the head pressure the waterstop will resist. 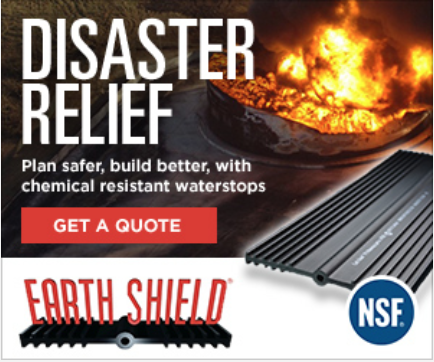 A small 4” waterstop is more than suitable for a containment wall surrounding a tank farm, or even a swimming pool in a back yard, but would be completely inappropriate for the foot of a large dam. Giant concrete structures such as dams or locks will require 9” wide waterstops or greater. It’s not just width (size) that effects waterstop performance, thickness also plays an important role. Just like conventional dams, the thicker waterstops are able to resist higher head pressures of water (or other aqueous fluids). Because proper installation plays such a critical part in the effectiveness of a given waterstop system, the very best waterstops are those that can be fused and fabricated easily. For this reason, the majority of today’s design engineers specify and require thermoplastic waterstops (such as PVC or #waterstop), and not the earlier thermoset varieties (neoprene, SBR, natural rubber). Thermoplastic materials have the ability to be easily field fabricated for simple change of directions and the joining of straight lengths; whereas, the earlier thermoset rubber materials generally were ineffectively glued and clamped together causing a severe weakness in the waterstop diaphragm and leaking. A waterstop’s cross-sectional area is called its profile, and there are lots of profiles to choose from, but really they all share the same basic anatomy: a series of fins or bulbs to provide interlock with the concrete, the body or web to provide the necessary rigidity and product width, and possibly a hollow cavity or bulb to enable the waterstop with additional movement properties. 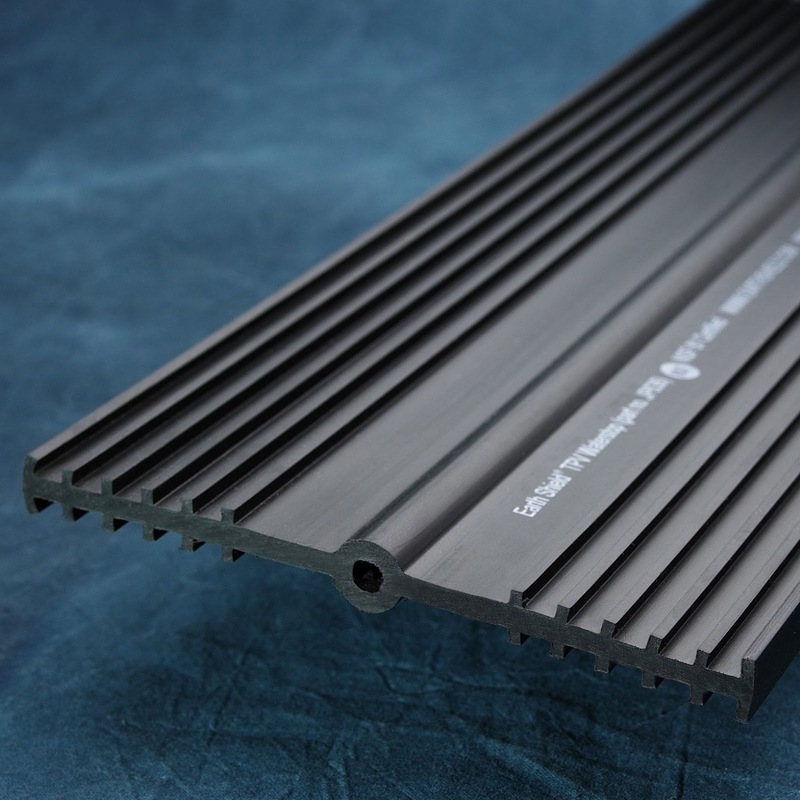 By far, the largest difference between various waterstops on the market today are the polymers they are constructed of, and the services offered by various manufacturer’s. It is up to the individual designer to find a manufacturer that offers the desired set of services and support for their project. These after-sale services and support are truly what separates a great manufactured waterstop from a poor one. Just remember, “Choose wisely.” A waterstop is permanently installed in concrete (much like rebar) and there really are no second chances to get it right.